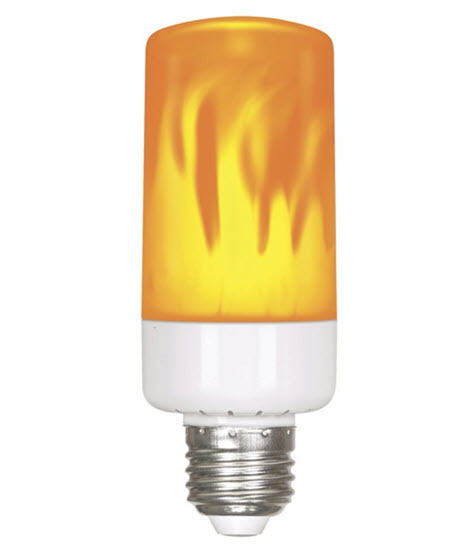 LED flame light bulbs are a new product with a characteristic flickering look. They give the illusion of a flickering candle flame for regular 120 volt rated light bulbs. They're not very bright, but they do give the effect that one would want with a flickering candle. They have a medium base they can be used in almost any situation and in almost any light fixture. You could use these in outdoor light fixtures such as posts lights or coach lights. It's a great way to get a nostalgic look while still using standard light bulbs. You can use these anywhere you use a regular incandescent bulb, there's nothing special you have to do to the fixture. Call us if you have any questions about flicker lights or any other kind of festive or decorative lighting. - Flickers like a candle. - Can be used wherever you use standard incandescent light bulb. At BuyLightFixtures.com, we want to make sure that we supply you with the highest quality incandescent lamps possible. And we do that by having traditional incandescents with longer life while still maintaining the light output and the appeal that they have. Of course, a lot of people are looking for energy-efficient sources of light like LED bulbs and for many applications that's the right way to go. But there are times when people want that certain warm glow that only an incandescent bulb can deliver. No matter what the energy efficiencies are, there are some who believe it is the best source of light for whatever they may be doing. Although LED technology is getting better at mimicking an incandescent, there's nothing quite like it for a lot of applications. It's incredible that it's been around this long since Thomas Edison introduced it has an electric current passing through a carbon filament, which makes it one of the most successful products probably ever brought under the marketplace. For over 100 years it has been an essential part of lighting across the world. Back then, electric light was unique and special. Today we can't imagine a world where we don't have lighting everywhere, and we expect that nighttime is lit up as well. Some incandescent lamp types can't be replaced by anything else for such applications as some forms of photography, some retail lighting, and many decorative light fixtures. These days many people consider LED to replace almost any of these and the applications continue to come out. There probably will come a day when incandescent will no longer be a viable light source. We probably guess that within the next 20 years are going to see most of it phased out. It is so very energy-efficient when over 90 percent of the energy used to light with incandescent goes out in the way of heat. If you're wondering how much energy you can save by going to an LED system or new light fixtures, we have an energy saving spreadsheet that is downloadable for free on the left-hand column of our website. It lets you input the data for what you have now and what you might be thinking about in a more energy-efficient light source. It will tell you exactly how much you're going to save in real dollars and what kind of a payback you could enjoy. For those of you in commercial buildings, it will give you maintenance savings as well in an estimated form. So payback is going to be very fast with something like going from an incandescent to an LED light. In doing so, you'll probably get a payback within the first year, even in home applications. It's incredible how energy-efficient LED is using 10 percent of the power that an incandescent lamp needs. For household and commercial lighting, we have many choices of light fixtures or new types of LED that will replace older style incandescent. We pair them with some high-quality light fixtures that are going to stand the test of time. If you're running a commercial building, you might expect to see 10 to 15 years of life with no changing of any light bulb. So it's more than just energy savings although that is probably the most significant part of this. New LED products fit in virtually any type of light fixture that you may have now. Often they have a screw in base if you're talking about just a bulb, and for light fixtures still, have the same connection so you can install them in place of less efficient sources. No one knows how far this type of technology will go at this point. The lumen per watt rating which is a measure of energy efficiency for LED continues to go up. It might get to a point where there are limits as to how far it can go, but at this point, there's no end in sight. What you're going to see is efficiencies get greater so that probably the savings would be 95 percent over incandescent lighting. Now for those of you who need incandescent lighting, we still have all the different choices that you may want. It could be anything from track lighting, recessed lighting or indicator lights, you name it, and we have it still. All the conventional sources are made including the floodlights, little halogen bulbs, landscape lighting, and outdoor floods. There such a large installed base of this type of lighting that many manufacturers are going to continue to make them for some time. As long as there's still money to be made by making these, they'll be made. We are starting to see more imports come in as the predominant manufacturer of this type of lighting. Some of the larger US manufacturers are trying to get away from manufacturing and incandescent type of light source. That's been going on for some time, and that will continue to be a trend as well. One of the things that people have trouble with is identifying the incandescent that they have. There are so many different types, and sometimes people discover that they have something unusual for the very first time because they've never had to replace it. If that's you, we can help. We have probably seen every type of light bulb out there, but on a rare occasion we do see something we haven't, but that doesn't mean we don't have it. We have resources that give us the possibility to have almost any type even the more unusual that you would see in the market. If you're unsure about it, you can always email or text as a picture of the bulb you have, and we can probably identify it from that image. Because we are lighting experts, it's easy to see what it is and identify it as the only thing that we may need to know is what watt bulb it is. That's one of the things that can be a little trickier to identify, but if we see the shape, we can probably get this easily figured out. If you call us and have a question about that, we can also tell you any of the alternatives that are more energy efficient and what kind of pricing and so forth that you could expect to invest in something that's going to pay back well for you. We want you to be happy with your lighting; it's just not about saving energy but giving you the best lighting possible in any situation. If you're not satisfied with your lighting, no amount of energy you save will make any difference. You'll still look at it every day and say why did I do this? So let's make sure that we get you the right kind of light for your situation, not just think about things like energy efficiency. Unfortunately, people made hasty decisions in the past based on saving money only, and they forgot about what lighting is for, to be good for people to see and do tasks. If you keep that in mind, then it's going to be easy to make the right decision that will cover both energy and good lighting. If you're looking for a more significant quantity of incandescent bulbs, then make sure you give us a call, and we can get special pricing for full cases. We want you to be happy and will do everything we can to make your lighting experience with us the best possible.